I'm pretty wary when someone starts trumpeting "gourmet barbecue" so I really didn't expect much from this converted gas station which recently opened just down the street from Poor David's Pub, one of my sometimes blues haunts. I had checked their website beforehand so I knew they did not offer sliced brisket, only chopped brisket, but I went ahead and asked anyway. Nope. You can only get sliced brisket through their catering service. What's up with that? Well I went ahead and ordered the chopped beef sandwich, an order of ribs, beans, and tater salad. The meat arrived slathered in sauce and the sandwich was open face with a generous mound of chopped brisket. Unfortunately the sauce didn't add much except to cover the taste of the meat almost completely. Next time I'll know better. 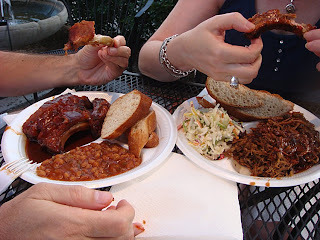 The ribs were very tender and definitely "off the bone" tender. I want to go back another time and get an order of ribs with NO SAUCE. Maybe there's some actual flavor in the meat. Sauced it was impossible to tell. The sides were average, and Scott spied some sausage being cut out of a big plastic shrink wrapper. Hmmmm. Glad I skipped that. I also ordered iced tea and got a bottle of "Lipton citrus green tea". How gourmet. Now the coolest thing about this place (except maybe the ribs which I want to try dry) is that they are open LATE, 2 am on weekends, and are close to the Deep Ellum club scene. Even average BBQ beats Denny's for a late night snack. This place lacks the funk of Sam's late night shack in Austin, but remember, this is Dallas! There is NO seating inside, but several small tables are available outside. I'd suggest BYOB and and be sure to get the sauce ON THE SIDE. additional: Went by this place at 2 am on a Friday night and they were packed with a full parking lot and a line out the door. Clearly late night BBQ in this area is a good idea! Update: I found out it is airing Tuesday, June 23rd at 8:30 pm central time. another update: Caught it and they did a fine job showing off one of my favorite local joints. However the "best thing he ever ate" was their brisket? Hey, there is a reason why they all wear shirts that say "Rib Crew"!!!! Regardless, I hope they get a lot of new business from the show. Also nice to see the Salt Lick as the end segment of that show. The show is being repeated several times in July on the Food Network. Well with Yahoo dropping or combining many of their services, including yahoo 360, I thought this would be a good time to relocate my Texas Barbecue blog. So here it goes. Over the next few days I will be moving all my yahoo 360 posts and photos over here and from now on my BBQ blogging will be here. 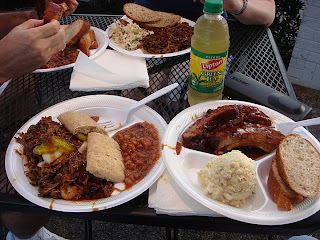 One of the standard questions I get is what is your FAVORITE BBQ joint? That's a tough question. Consistency is the key to truly great BBQ. On any given day you can get a bad or great meal almost anywhere. The best joints are those where you get consistently great food, every time. It's important to also remember there is no "best", only favorites. That said, here are mine. My overall favorite is Luling City Market in Luling, Texas. Even though I can't stand their mustard sauce. However their meat is so great who needs sauce? Second would be Black's BBQ in Lockhart, Texas. Consistently great meals there. 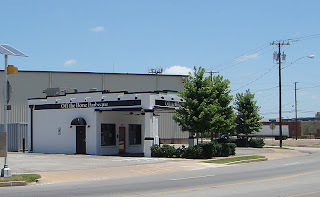 My favorite local joint (DFW) is North Main BBQ in Euless, Texas. Two times world rib champs and all you can eat for $12. Their sides are very average, brisket can be very good but is inconsistent, and they are only open Friday, Saturday and Sunday. However their ribs make up for everything else. They are outstanding. Favorite sausage I've ever had is at Kreuz Market, Lockhart, Texas. Their jalapeno cheese sausage is to die for and is consistently great. I try to keep some in my freezer at all times but it never seems to last for long. Favorite brisket I've ever had was at Vencil Mares' Taylor Cafe in Taylor, Texas. Scott called it "brisket nirvana", and it was. It is not consistently that great, buton that one day, man, oh man. My favorite tater salad is still at Baker's Ribs in Dallas, Texas. Creamy mayo-based with lots of dill. My favorite sauce is North Main BBQ's 406 brand. Dr. Pepper BBQ sauce is another favorite.